I spotted these “bite sized ice cream snacks” at the local Kwik-E-Mart last week. They looked good, so I thought I’d give them a try. I’m sorry to report that I was very disappointed with them. What should be a great tasting snack is just plain boring. There is nothing special about the vanilla ice cream or the chocolate coating, and there isn’t enough Crunch Coating to make a difference. If you want an ice cream snack, stick to something you know is going to be good such as a Big Ed’s Super Saucer or an It’s It. Note: East of the Rockies, Dibs are sold under the “Edy’s” name. It's It! OMG I remember those! Sooooo good. They're freakin god-like! umm dibs are okay and umm yeah bye HIIIII MOMMMMMMM!! Look here, you get the Peanutbutter Dibs and your straight. Don't worry about this kid dissing on the Dibs he's a fool. 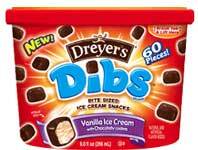 I absolutely LOVE Dibs...eating them right now as a matter of fact. Everyone should go out and try them! I keep these in the freezer for those chocolate and ice cream cravings. Just 2 or 3 is a good fix, and only about 16 calories each! I like the choc. covered strawberry ice cream Dibs best! Somehow I feel less of a sinner and more like I have self control! I don't need a dish of ice cream or some huge chocolate dessert when I know I can grab a couple of these anytime I 'need' to. Dibs are the bersdt thing i have ever tasted. I don't think I can trust a person that doesn't like dibs or dip n dots.